It’s that time of year of teaching procedures and expectations. One of those for my class is how to find a just right book. This is difficult for many of my little readers. I use the analogy of trying on shoes to help! 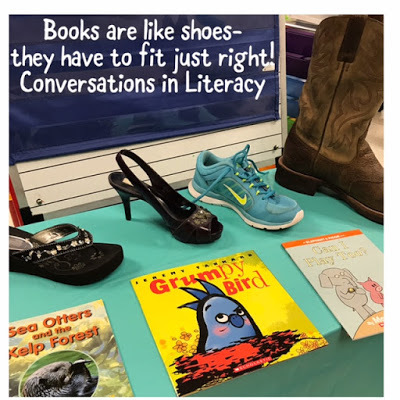 A just right book should fit like a good pair of shoes! I brought in one of my flip flops, high heels, tennis shoe, and my youngest son’s boot- size 16! I also ask for one of my student’s shoes to put on the table too. We talk about what happens when they go shoe shopping. All of them are familiar with this process so it is easy to make the comparison to shoes. First, you find a shoe or book you are interested in. No one wants an ugly shoe or a book that is boring to us. Then the shoe must fit us. It can’t be too little like the volunteer’s shoe would be on me. And it can’t be my son’s boot! They love this one! It must fit JUST RIGHT. I try on the shoes to demonstrate this. Then the shoe must fit the job- who would wear a pair of purple high heels to run in PE? No, I would choose the tennis shoe. 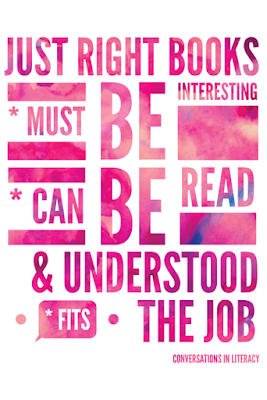 So you need to choose the right book to fit the purpose you are reading for. 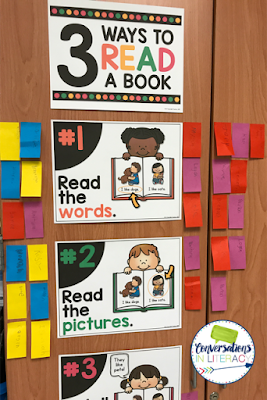 Another day, we learn about 3 ways to read books. After discussing these 3 ways and demonstrating them, off we go to read and practice. After we read, we gather on the carpet to talk about what ways we chose to read. I passed out Post It notes for them to write their names and then stick them on the ways they practiced. Great visual! You can check out these great posters from The Teachable Teacher by clicking here. And they are free!! 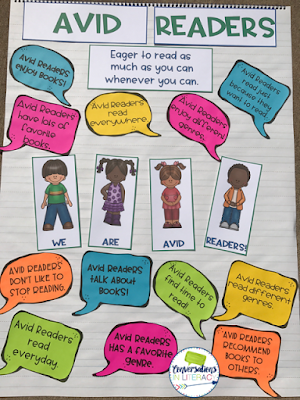 Another great chart is the Avid Reader Chart! 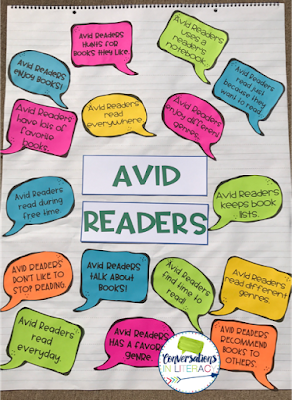 Talk about what an Avid Reader is and what they do. This makes for a great discussion! You can match up remade speech bubbles to your student’s answers to create your chart in different ways or you can use the editable speech bubbles to type in their answers. Printing them on colored paper makes a colorful, stand out chart! You can see this chart here. 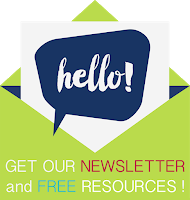 Have a wonderful week with your readers!